We start episode 16 in training with Gwang Taek and Dong Soo, as Dong Soo kneels and swears to work until he surpasses his master in all of the martial arts. He’s also given a blank to make his own sword. Over at the Assassins, Un is also upgrading his skills. However, Chun is still off gallivanting around Joseon, so for Un, it’s more of a self-study course. The King has dismissed the Prince’s guards, so they head over to Sa Mo’s to drink. They are worried about who is going to replace them, especially since Gwang Taek is out of town. Sa Mo tells the 3 mountain boys that they are going to train until they can be the guards. Mi So, bless her heart, also insists on getting some training in. Sadly, the 2 guards decide that they should try taking out Lord Hong. Who was waiting for them. When they start to escape, Un steps in and kills them as they make a final attempt to kill Hong. We get a little flashback, in which Hong tells Un that he knows Ji Sun is starting a trading group, and that he can bring her down with just a word. Un basically agrees to defend Hong in return for Ji Sun being left alone. Back at the Assassins headquarters, Un remembers, with frustration, various people telling him whether or not he’s got killing in his heart. Ji comes out to tell him that she can tell that he’s killing because of his feelings. She advises him that this is the path of death for an assassin. To be ruled by his heart instead of dispassionately killing, is the path of destruction. He tells her that he gave up on his heart long ago (ah, echoes of Chun). Jin Ju returns with a load of fur hats. She tells Ji Sun that she bargained hard and got them for a lot less. As Jin Ju leaves, 2 baddies are lurking outside, and start sneaking in towards Ji Sun, clearly up to no good. However, Un is also keeping an eye out, and before the baddies can get in, he knocks them out. Ji Sun sees him, and Un leaves without saying anything, however, she tells Sa Mo that Un was protecting them. Since it seems that trading is attracting thieves, Jin Ki offers some of his bandits as guards. Ji Sun asks him and Sa Mo to join in the trading group, as it is turning out to be a lot of work. So Jin Ki tells Jin Ju to stick with Ji Sun and help. Jin Ju agrees before realizing what she actually agreed to. The fur hats turn out to be quite a popular item, and they start raking in the dough, particularly with Jin Ju as a saleslady. Ji Sun decides to expand into the ginseng market. There is a big demand for ginseng. Jin Ju points out that despite fierce competition, there is a nice little niche that is available. Qing and Japan are at odds. Joseon trades with both. Sell ginseng in Japan in trade for silver coin, sell ginseng for gold coin and use silver coin for tax in Qing and using the gold coin, buy fur caps for sale in both Joseon and Japan. (ok, this was actually really confusing – it’s a three way deal with 2 deals being made at each step – so I hope I sorted this out right). The upshot of the thing is the girls have a plan to trade ginseng and fur caps in Japan and Qing and make money at it. So, the bandits turn into merchants, and a business is born! Jin Ju and the bandits seem to be doing all the leg work, while Jin Ki, Sa Mo and Ji Sun hang out in Joseon doing the marketing and organizing. ::more musical interlude of Dong Soo training:: plus because he remembers Un paralyzing him with acupuncture, he also decides to study up on that and some other things that might come in handy. Un is also training, and following a similar but slightly different set of exercises. TIME LEAP!!! 3 years later, which would make it about 1765, we see a ship arriving, with Dae Ung and a new guy. The voice over tells us that they are here to take over the Assassins, with the new guy, Chang Ryang, to be installed as the new Chun. Dae Ung arrives back at headquarters and calls out for Chun. He’s startled to see Un come out, and asks where Chun is. He’s told that Chun has left, and Un in charge, which Dae Ung finds absurd. Ji also comes out, and Dae Ung gets a little overfamiliar for her taste. He turns and proclaims that by imperial order, the new Chun will be Chang Ryang. Chang walks in and the assassins are unsure what to make of this. They wait until they see what their leaders do, and after a moment, Un kneels to Chang. The others follow. As Un and Ji sit, Dae Ung gloats about coming home. He asks where Chun went, and Ji and Un ignore him. He recalls that Chun has his list of fighters, and that he’s probably out hunting them down. And now, for a little Chun action! He’s by a river, cleaning up after a fight, when he hears a horse. A challenger has sought him out! One pass of the horse, and the rider is felled, falling in to a river. 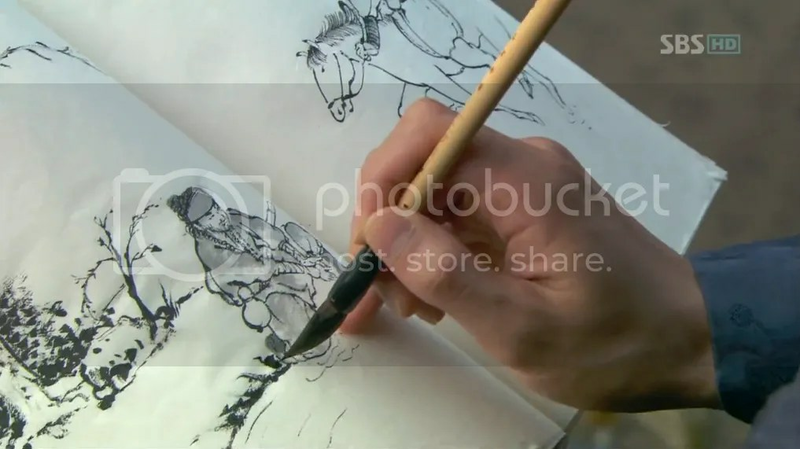 And on a nearby bridge, we see Kim Hong Do sketching the scene. Lord Hong, in the meantime, is enjoying a nice meal with the gisaeng when Dae Ung shows up to gloat some more. 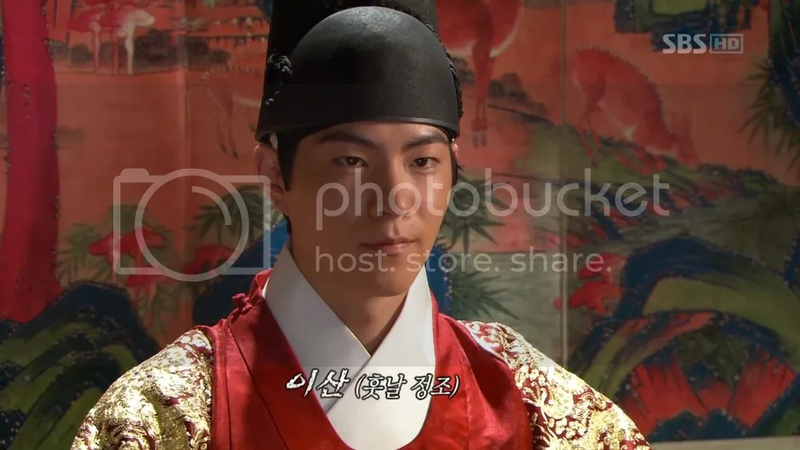 After Dae Ung clears out, Hong has to explain to the Queen’s father just who that rude idiot was, and what is going on. Hong says he uses him as a servant to clean things up. Now it’s time for the civil service test results! 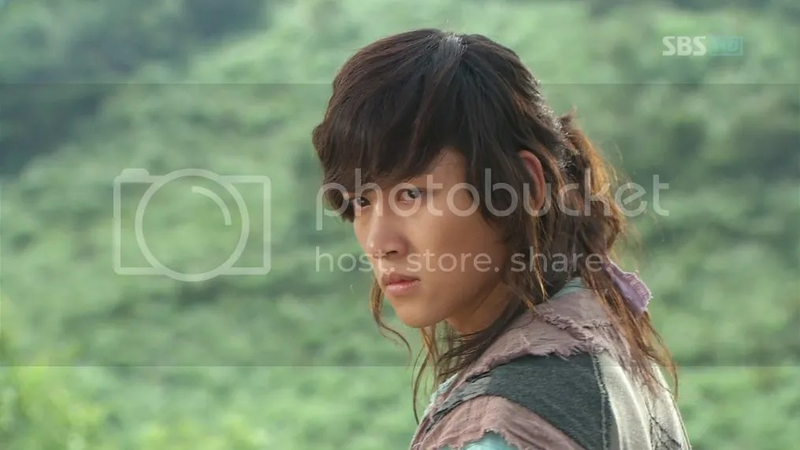 The three mountain boys have passed well enough to become guards, and we see Cho Rip there as well, but the boys don’t stop to talk with him because they didn’t see the name Yang Cho Rip on the lists, so assume he didn’t pass. But the artist, Hong Do, who really gets around, notices that Cho Rip’s real name Hong Guk Yeong is on the list as passing the government exam. That evening, as the boys are partying at Sa Mo’s to celebrate, Hong Do shows up as well to announce that he passed the artists exam, and informs them that Cho Rip had passed under his real name. Sa Mo has to explain to the boys that he knew Cho Rip’s real name, but kept it a secret so that they would treat him like everyone else. And we’re back with Dong Soo, who is finally finishing his sword. He’s managing to not only hold his own, but match and finally beat Gwang Taek. 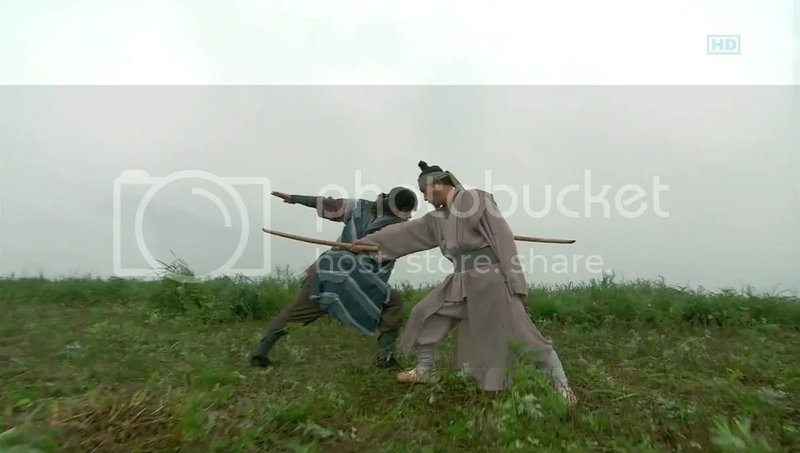 And then, we get a lovely matching scene of both Dong Soo and Un doing an exercise where they murder innocent pine needles falling in the forest, except Dong Soo finishes with more finesse – a dragonfly and a needle balanced on his blade. The three mountain boys are installed as guards for the Prince (who has taken advantage of the Crown Prince time warp, magically appearing to have aged 8 or so years in the 3 years that we’ve leaped – in reality in 1765 he’d have been about 13-ish – but let’s not dwell and assume that he’s really the 20-ish that he looks). They go to visit the palace library and find Cho Rip/Guk Yeong there, working away. The Prince asks for the Classic of Poetry, another of the Confucian Classics. The Prince happens to encounter Lord Hong (as well as Hong1 and Hong2) on his way out of the library. And while Lord Hong unctuously compliments his diligence in studying, he also snickers to himself on noting the book that the Prince was reading. The Prince visits the King, who asks after his health. The Prince thanks him for the ginseng tea that helped him recover (sigh, why beat it to death, Show? ), and they start to talk of his studies. The Queen, presumably having been prompted by Lord Hong, asks what he’s been studying. Well, that would be the Classic of Poetry, eh? Oh my! It seems the King has forbidden the study of this book, and asks for the Prince’s copy to be fetched from his rooms. Ah, but instead, the King is pleased! It seems that he forbade the study of this book because of the passages on parental love. However, the Prince was reading the edited version where those passages were redacted! By Cho Rip in fact, who thought ahead and kept the Prince out of trouble, earning the Prince’s gratitude for his forethought. 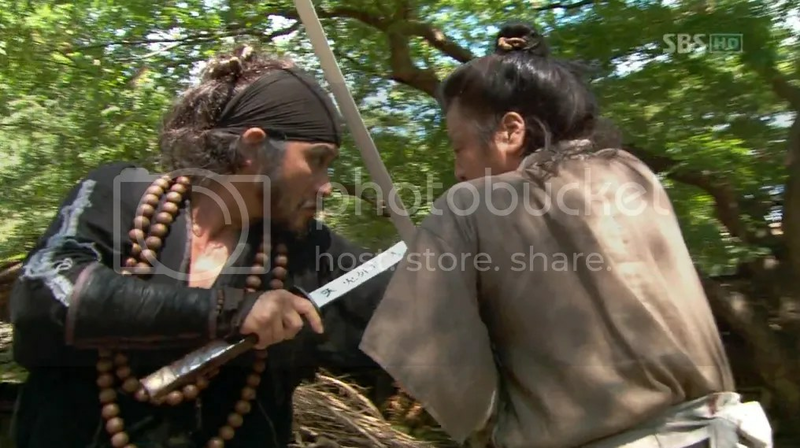 Gwang Taek has a final lesson for Dong Soo – how to chop down a tree with your sword. Okay, it’s really about the proper use of power, like a karate kick through a board. 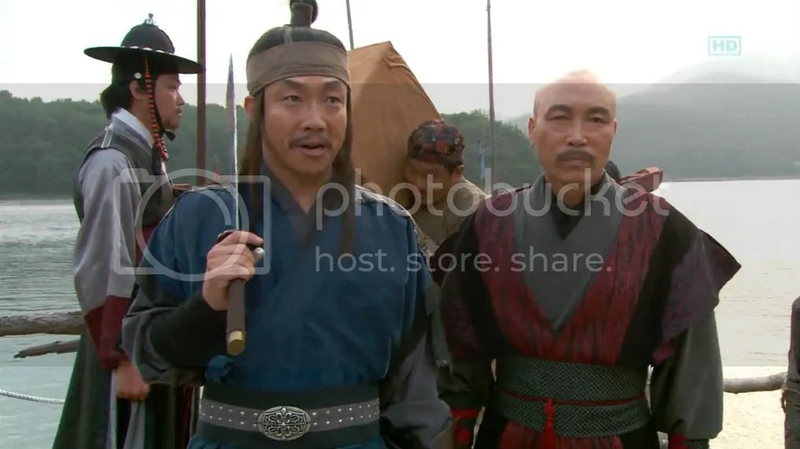 In complete contrast to what Ji had told Un, Gwant Taek had told Dong Soo that the sword SHOULD move with the heart. 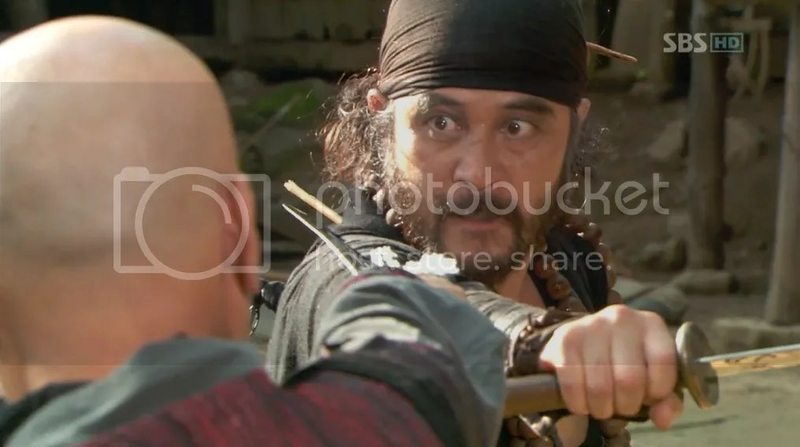 Chun has tracked down Jang Tae San, the bounty hunter who uses a flail. While this takes more effort and work, Chun makes rather short work of him as well. Afterwards, they share a companionable drink or three. The mountain boys bring the Prince along on a visit to Sa Mo’s. The Prince wants to know where Gwang Taek has gotten to, and Sa Mo says that while he knows where he is, he can’t really contact him. 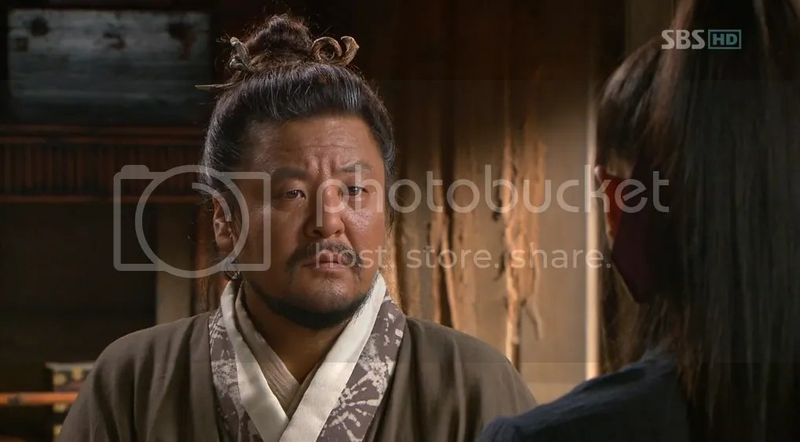 It seems that it’s actually the King that wants to find Gwang Taek, so Sa Mo promises to try to get the message to him. 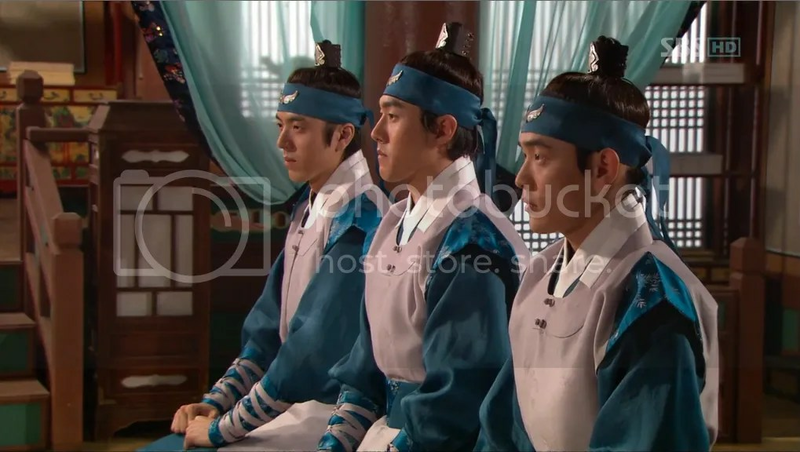 As the Prince comes out, he spots Ji Sun, who has a rather creepy response to seeing the Prince, seeing a flashback of the previous Crown Prince, his father. Ji Sun has a new project in mind, cultivating ginseng. She has seeds, and is going to grow some to test different varieties. Jin Ju comes in to have Ji Sun look at some ginseng for her. She turns into the ginseng elucidation bunny, helpfully telling us that ginseng isn’t actually local there and she isn’t good at identifying ginseng varieties and to sell ginseng you need an official permit, and these things are all difficult. Okay? Chun draws a line through Jang Tae Sun’s name, and Tae Sun objects to the list. He says that the list shows him as an equal to Hwang Jin Ki, and that’s not right. Chun asks if he knows Jin Ki, and Tae Sun says that he’s a bounty hunter, so he sure knows Jin Ki – he has a big bounty on his head. Chun asks him why he never went to catch Jin Ki. Tae Sun says he tried, but Jin Ki defeated him so he gave up. He puts Jin Ki’s skills as equal to Chun’s. Well then! Chun recalls that the minion had also told him that Jin Ki had lost agility, but gained strength. I guess we know where Chun is headed! Ah, but someone overheard this conversation, and reports it back to Dae Ung as he sits with Chang, Un and Ji. Dae Ung asks if anyone has a problem with this? The rule is that to become Chun, you have to kill the previous occupant of the seat. He points out that Ji’s father was killed by Chun. So be it then! 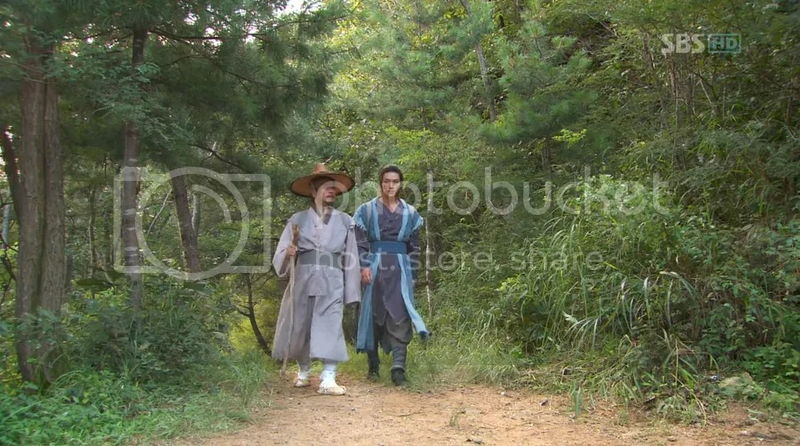 Dae Ung and Chang head off to track down Chun, when Ji warns them that while she won’t object to them trying, it’s an impossible task. Dae Ung replies that he will be on the winning side, and Chun will die. Un leaves with them, as Ji stays behind. Dae Ung reports in to Hong, who says that he thought Jin Ki was dead. Dae Ung reports that Jin Ki is alive, and Hong gets angry at Ji for saying he had died. Dae Ung says that in fact, Ji is the only one who knows where Jin Ki is. (not actually true, since Un probably knows as well, but Dae Ung doesn’t know that and Un isn’t telling.) Hong offers him the use of troops to help catch Jin Ki. Dae Ung figured that having heard they were hunting him, Ji would lead them to Jin Ki if she tried to warn him. And sadly, that is what happened, when she led them Jin Ki. 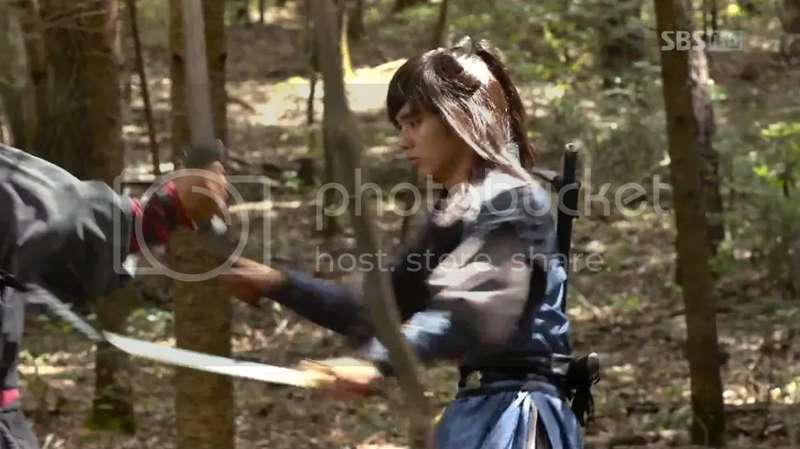 Ji warns Jin Ki that Chun is out hunting for him, and that Dae Ung and Chang are out hunting for both him and Chun, probably with troops to help. She tells him to take Jin Ju and escape, but he refuses. She insists Jin Ju should be taken to safety, and says she’ll do it,. Just then, Chun arrives, calling out for Jin Ki. He says Ji should stay inside, and he’ll go out and send Jin Ju to her. Chun and Jin Ki trade greetings, as Jin Ki tries to get Jin Ju to go in. Chun says he questioned whether or not to fight Jin Ki until he heard how much stronger he had gotten, and so he just has to test it. Ah well, what can you do? Jin Ki apologizes, and Chun says oh well, we’ll just see and that’ll be that. Jin Ki waits until Jin Ju has gone inside, and when she does, Ji decides to put a stop to it. She goes outside to confront Chun. He asks why she’s there and she tells him to stop. He says that she knows he can’t. She tells him that Chang has come from Qing. He realizes that Dae Ung and Chang must be looking for him. She warns him that they will get there soon. However, he doesn’t care. He’s come this far, and will continue forward. Jin Ki tells Jin Ju to go back inside, and when she objects, he tells her that no matter what happens, she isn’t to think of taking revenge. Gwang Taek and Dong Soo stroll down the path, headed back into town. At a little cross path, Dong Soo politely asks to go separately for a while. Gwang Taek agrees and tells him not to take long. Dong Soo bows, and goes his own way, and is worried to see a mass of government troops moving along the same path. Next, we see Chang, Un and the assassins also headed down a path. So they are converging on the old bandit hideout. Dae Ung rather nastily advises Un to kill Chun once they’ve finished with Jin Ki, which is odd, if you consider that it should be Chang who kills Chun in order to take over the Assassins. Jin Ki and Chun are fighting, and the assassins start getting into position. As Jin Ki ends up in a position where Chun could finish him, a hail of arrows comes at them, and they both start fending them off. Several of the bandits fall, as Chun, Ji and Jin Ki evade the arrows. 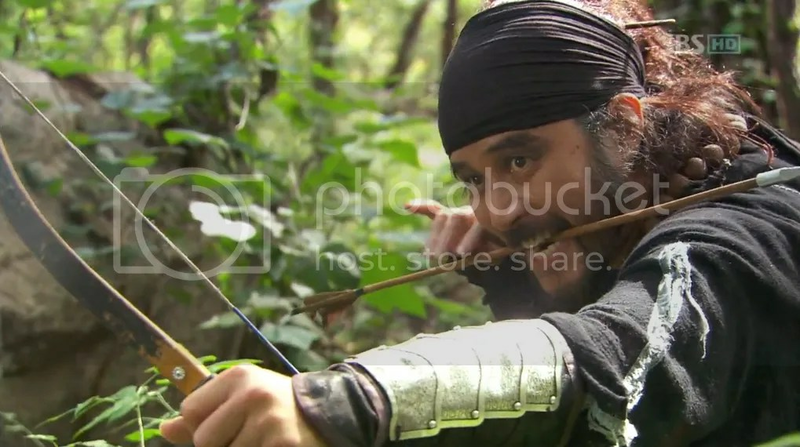 Jin Ki takes an arrow to the leg, and Jin Ju rushes ahead in alarm towards him. As an arrow heads for Jin Ju, Ji throws herself in it’s path, taking the arrow in her back. Jin Ju starts screaming for her mother, even as Ji assures her it’s ok, she’s ok. Dae Ung is truly astounded to hear Ji called “Mother.” Chun is also floored, and rushes to find out why Jin Ju is calling Ji “Mother.” He demands to know if she called Ji her mother. Jin Ju nods. Chang asks Dae Ung if that is Chun, and is told that he is. Chang takes an arrow and throws it at Chun like a dart. It strikes him in the back, and as he catches a second, he tells Jin Ju to get Ji into the house. Chun covers their retreat. The assassins move forward, and Chun greets Un, and agrees that he’s acting properly. Dae Ung, on the other hand, he insults. And then he offers to kill him again. (I do love these customary insults.) Dae Ung says he’s not only brought troops to kill Chun, but also Chang. Chun and Chang go at it, and after a look around, Chun retreats to the building. Dae Ung approaches Jin Ki and tells him to fight and he also tells Un to be the one to finish him. Jin Ki rises, and tells Un that he has truly become a monster. Un replies that he’s only been true to his fate. They draw their swords. In the meantime, Jin Ju has helped Ji into the building. They are stalked by several assassins, and the reason Chun retreated becomes apparent, as he’s covering their backs to make sure they are safe. Ji urges Jin Ju to get out, but she refuses to leave without her. Chun distracts their stalkers and bulldozes through them, tossing them aside and hacking them down. 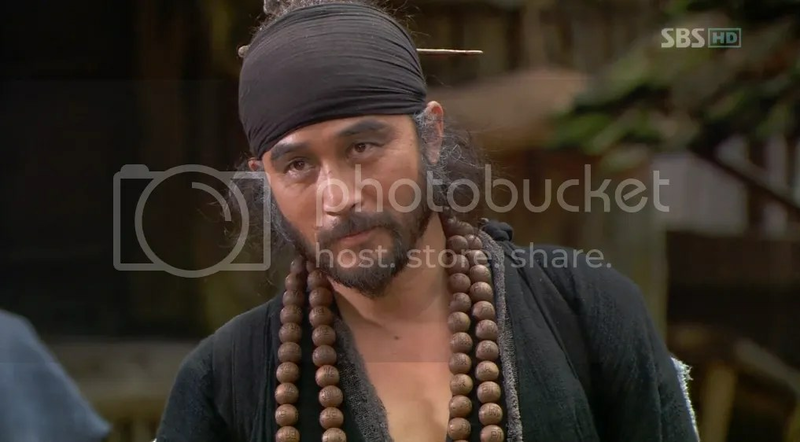 When he makes his way to Ji and Jin Ju, Ji tells him to save Jin Ju. 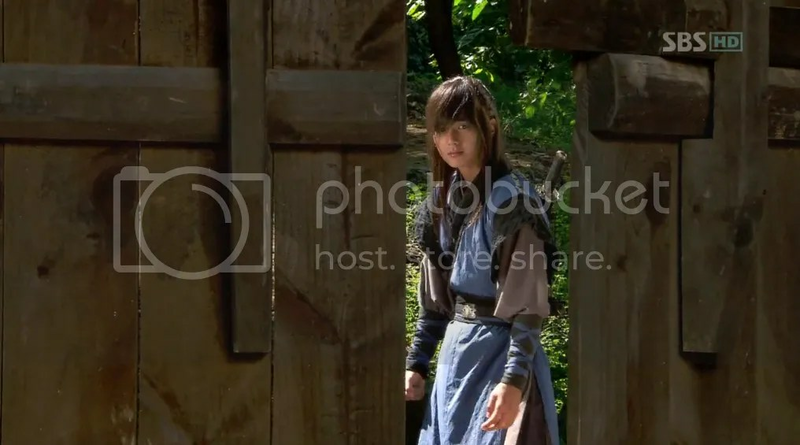 With one fierce nod, he grabs the protesting Jin Ju and tosses her out the back door, telling her that he will protect her mother, she should escape. He takes the arrow out of Ji’s back and tries to get her to get up, telling her that he can’t live if she dies. But first, she begs him to save Jin Ju, and in desperation, she grabs him and tells him that Jin Ju is his daughter. With a stunned twitch, he asks her what she just said. And she repeats, that Jin Ju is his daughter. And on that astounding note, we end episode 16!!! Well, well. I didn’t see that coming. I think everyone assumed that Jin Ju was Gwang Taek’s! It’s also interesting that while Chun had figured out that Ji was protecting Jin Ju and Jin Ki for some reason, the penny had never dropped that Ji was Jin Ju’s mother. Whew! ::wiping brow:: I have to say, I had more trouble understanding this episode than any other. The recap notes several places where my language skills hit a big fail whale and sank. It reminded me of Chuno, where the whole court conspiracy left me in a big fail mode. Life or death, flirting, yelling threats, insults, pleading with the King – perfectly fine. Business talk – not so much. Let’s all thank the director for minimizing the flashbacks and voiceovers for a change. And now as we go forward – all I know is that it does NOT pay to piss Chun off, and some people will live (or not) to regret doing so. Keke, you’re on a roll, my dear. Your longest recap yet (I think) at 3,400 words, woot! hehehe! And most of that for the closing scene, too! You think I had enough screencaps of that? LOL! Kind of went nuts there, didn’t I! But do you really think Jin Ju is Chun’s daughter and not a desperate attempt on Ji’s part to get Chun to protect Jin Ju? Methought she lied. Wow, beautiful that first picture! I know! I loved that scene. And the setting where YW was sitting and the way he was sitting was really cool. Thanks for the recap momosan. Lovely recap as usual. I really hate that YW is being blackmailed into killing people because of JS when she doesn’t love him. Its sad to be the one protecting someone when you can’t keep them by your side. I think overall this episode had less important scenes of my fav boys, what with both of them off practising swordplay. And Chun was not in the midst of it all till the end either. The ending was amazing. I remember my jaw dropped when I first watched it. And then I squealed in delight because I love my Chun. My fav scene was the one were the boys “murder innocent pine needles”. I thought that was beautifully done. I may overtly fangirl squeeeeee! for the WDBS youngsters, but it was the ajusshis who OWNED this episode. Like fine wine (most of it in Cheon’s belly), they’re getting better and better!! Thanks for the funny recap! Loved this “She turns into the ginseng elucidation bunny.” That’s what my son and I were laughing at, too. My my! Someone has been reading Joseon-wiki! Love the training dances, but really, shouldn’t BDS be trying to kill scarecrows instead of beans, pine needles and that poor tree?!!! I agree with anais, Chun is not Jin Ju’s apa. Just a feint. I am so far behind. I am doing everything I can to avoid spoilers!